Is that sunshine I see this morning here in Cleveland Heights? Such a change from yesterday morning when the snow was falling and accumulating! I think it’s safe to say we’re all ready for this winter weather to be done and over! The forecast isn’t calling for snow, but the temperatures won’t be warming up any time soon! Make sure your furnace or boiler is in good working order for these Northeast Ohio temperatures! Regular maintenance on your heating system insures that it’s operating at it’s peak efficiency and maximizes the life of your equipment. 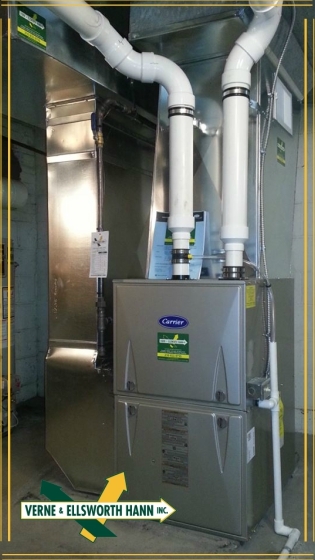 Verne & Ellsworth Hann, located in Cleveland Heights and servicing the Heights area for over 63 years, recommends a tune-up/safety inspection on your furnace or boiler annually. Verne & Ellsworth Hann also offers annual Hann Home Plans that include yearly maintenance. Verne & Ellsworth Hann’s experienced technicians will clean your heating system burners, clean the pilot and adjust the ignition system, check all the safety controls, lubricate any moving parts, inspect the heat exchanger, check the flue and check the thermostat. They will make recommendations if needed and answer any questions you may have. They are extremely knowledgeable, professional and friendly. If you live in Cleveland Heights, Shaker Heights, University Heights, Beachwood, Solon, Moreland Hills, Richmond Heights, the surrounding area or even parts of Geauga county, call the office at Verne & Ellsworth Hann, 216-932-9755, to schedule today. Ask about our current special and remember it’s never too late to schedule your heating system tune-up!